I love seeing DIY projects that retrofit new hardware into old electronics. Some examples include converting an Apple II floppy drive into an external USB hard drive, and shoving a Raspberry Pi into the casing of a Commodore 64. 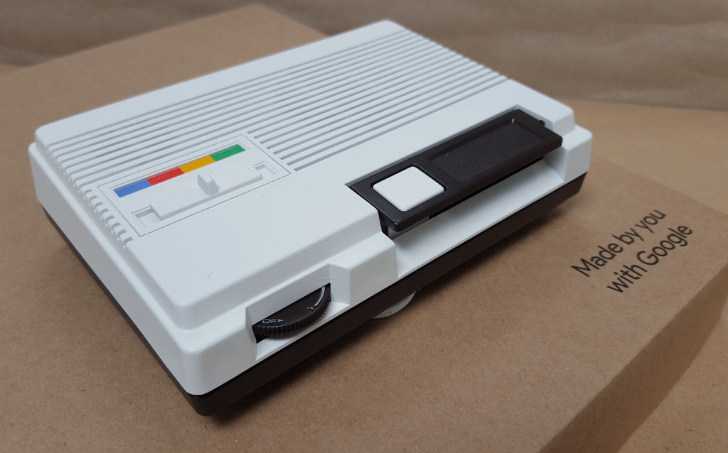 Martin Mander shared his latest project on YouTube and Instructables - a 1986 home intercom with Google Assistant. As you can see in the above video, Mander cleaned up and painted an old "Plug N' Talk" wireless intercom and installed Google's AIY kit inside. We previously covered the AIY Kit, but it includes everything you need to get Google Assistant running on a Raspberry Pi (like a speaker and microphone). Once completed, pressing the talk button on the intercom activates Assistant. I recommend reading Mander's Instructables post, as it includes details and pictures about the conversion process. He hit a few snags along the way, like having to source another microphone because the kit's mic was too large to fit, but the result is great. At the very least, I think it looks cooler than nailing a Google Home to your wall.